The American-born, centrist Israeli thinker and writer, Yossi Klein Halevi, (who is published in The New Republic) returned to the U.S. to explain to Americans how Pres. Obama's behavior and policies towards Israel are intentionally undermining the friendship between the countries. Worse, he describes how detrimental, he feels, the Obama Administration's contemptuous treatment of Prime Minister Benjamin Netanyahu bullies all Zionists. This transmits a signal to the world that "it's now open-season" against the Jewish State. An obvious example of that, Mr. Halevi says, is Britain's expelling the head of the Mossad desk in the Israeli Embassy in London. The message to the jihadists, he believes, is to encourage Iran (through its proxies Hizbollah or Hamas) to open a limited front of attacks against Israel, with the expectation that Obama will step-in and prevent Israel from comprehensively eliminating the threat, while publicly diminishing Israel's public image by portraying him as having to restrain their aggression. In our video of Mr. Halevi's speech in Los Angeles from April 22nd, Halevi explains many of his views on the relationship and the situation, including how Obama's ambition to force creating a Palestinian State with a hostile Palestinian population would be an existential threat to Israel. If Obama doesn't stop Iran from going nuclear, there will be no possibility of peace in the Middle East, as Jihad forces (Hamas) in the mid-east will be united around Iran against Israel. "Obama will be judged by Israel by how he handles the nuclear issue with Iran. And from what we've seen so far, with one deadline after another, we in Israel frankly have zero confidence in the backbone of this Administration." "We are seeing potentially a tragedy of historic proportions." Mr. Halevi deconstructs what he sees as Washington's misguided priorities of achieving stability in the Middle-East. Halevi spoke at Nessah Israel Synagogue in L.A. at an 22 April event organized by 30 Years After (and co-sponsored by the Jewish Journal, and OLAM Magazine). Here is Part II of the event - the interactive question and answer period. "For about an hour, Halevi had us riveted with his anatomy of a deteriorating relationship. At the end, the big question lingered: Why would Obama act this way toward a great ally? If it’s not anti-Semitism or tough love, is there a larger narrative that speaks to the soul of the man — a narrative that might explain why he bows to America’s foes and mistreats America’s friends? 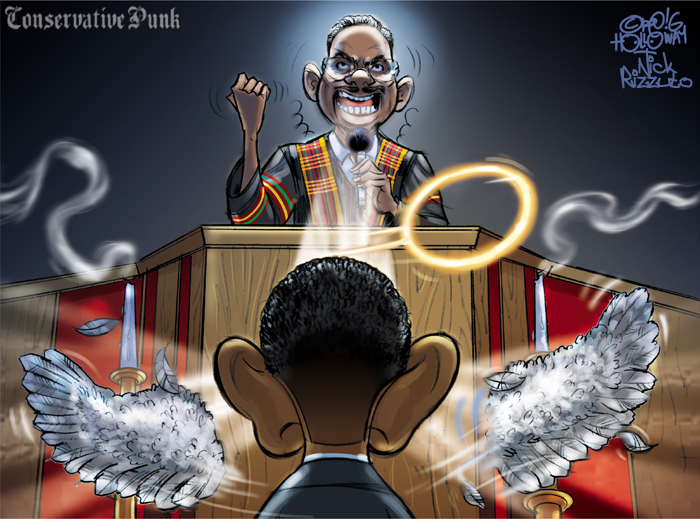 Here’s one possibility: Maybe Obama sees his calling as bigger than America, and he wants to be President of Humanity. Most seriously, Ceaser worries that “the conflicting demands of the Religion of Humanity and the presidency of the United States have become most apparent in the administration’s approach to dealing with the threat of Islamic terrorism. It’s hard to say how much truth there is in Ceaser’s analysis, but it does add to the debate of understanding Obama’s behavior toward Israel. At least it gives us something more noble than the hysterical “Obama’s an anti-Semite” accusations that I see in my inbox every day. And let’s face it, there is something noble about having a heart for all of humanity. The problem for Israel, of course, is that most of humanity already hates Israel, and if you’re Obama and you want to woo all of humanity, well, I can see how tiny Israel would be a major irritant." George Gilder declares humankind's interest in safeguarding Israel from resentful delegitimizers. Author of, The Israel Test, Dr. Gilder elucidates how supporting Israel to be your ally benefits the human condition via medical research & cures, communications technology, security intelligence, and economic stability. Recorded at Los Angeles' Sinai Temple; interviewed by Rabbi Steven Wolpe, Q&A led by AIPAC's Elliot Brandt, concluded by Avi Davis. Europeans frequently view Iran’s genocidal threats against Israel as a way to make use of the annihilation of European Jewry as a catharsis to alleviate their guilt-ridden history. American Jewry's pre-suppostions about Israel-Palestine conflict examined in theatrical drama, "A Tiny Piece of Land"
Israeli diplomat, Gil Artzyeli, deputy Consul General of Israel, Los Angeles addresses a post-performance audience - alongside playwrights, Joni Browne-Walders and Mel Weiser, creators of the theatrical drama, "A Tiny Piece of Land." The play confronts media-fostered, liberal, pre-suppositions about Israel's ethics in defending themselves against Palestinian hostility and intransigence. The play runs at L.A.'s Pico Playhouse through Saturday, April 24th. Watch this exclusive Joo-Tube video interview with Pat Boone filmed in Beverly Hills. Published on Easter Monday in NewsMax: "Differing from virtually every previous U.S. president, Mr. Obama seems to accept the claims of the Palestinian leadership, even the violent Hamas, that the land given by God and settled by Israelites thousands of years ago now rightfully belongs, at least in large part, to settlers who moved into the area only in the last 200 years. And though the Balfour Declaration and the United Nations — and most of civilized society the world over — have acknowledged and verified Israel’s claim to their historic homeland, this president is doing everything he can to pressure Israel’s leaders to cave in to the demands of the terrorists. The able and much respected Netanyahu and his aides had flown to Washington to bolster the Israel/American accord and to explain in person why new dwellings have been planned in Jerusalem, Israel’s ancient capital. Obama and his aides have been all but ordering Israel to stop all building (on their own land) that offends the Palestinian leadership. This, the same Palestinian leadership that continues to rain rockets and missiles and other forms of terror on the Israelis. When the meeting seemed be going nowhere, the president walked out to have dinner with his wife — leaving the startled prime minister and his aides, saying “Let me know if there’s anything new.” And he never came back. In 1948, President Harry Truman was also in the middle of a historic conflict over the Jews and their claim to their ancient homeland. His advisers were all urging him to ignore that claim and side with the much larger Arab contingents who were denying that claim and threatening to “drive them into the sea.” Politically, the Arab side was the expedient one. But Truman knew his Bible, and he was agonizing over the decision. On March 13, his old friend and former haberdashery partner Eddie Jacobson flew in to Washington from Kansas City. The two old friends spent an hour behind closed doors in the Oval Office, during which time Eddie reminded Harry of what they both knew of God’s promises to the Jews. And when the doors opened, President Truman had decided the United States would be the first nation to grant diplomatic recognition to the new state of Israel on May 14, 1948. Long after he left the White House, Harry Truman declared that decision was the most important of his presidency. I want America to blessed, don’t you? Israel deserves the eternal right over their own historic homeland. What we need is another Harry Truman in the White House." 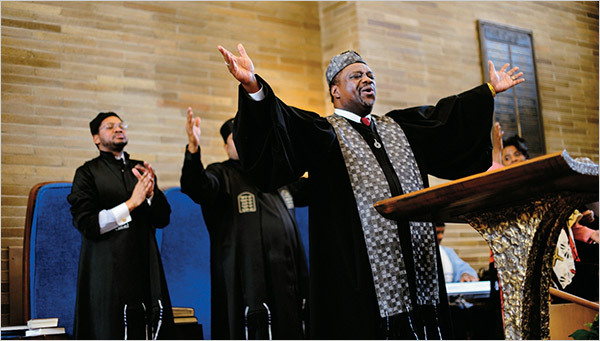 See also N.Y. Times articles: Black Rabbi Reaches Out to Mainstream of His Faith and Obama’s Rabbi (N.Y. Times photo pictures Shabbat services at Beth Shalom B’nai Zaken Ethiopian Hebrew Congregation in Chicago, which has more than 200 members). WTTW-TV's Chicago Tonight profiles Cong. 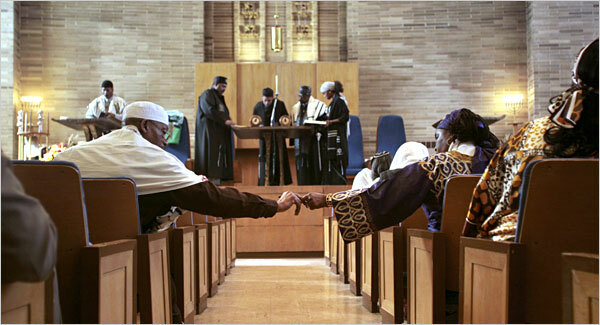 Beth Shalom in 2007 in this video segment. 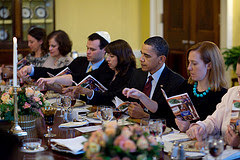 Jonathan Tobin writes in 2 articles (redacted here by Joo-Tube) the Jewish World Review "New World's Record for Chutzpah: Obama's Seder": "This year, along with the conventional four questions of the Passover Seder, some Americans are starting ask themselves "Why is this president different from all other presidents?" The answer is that Barack Obama has now established opposition to Israel's hold on its capital as a cornerstone of American Middle East policy in a way that is completely new as well as dangerous. Those wondering whether or not this development ought to cause them to re-evaluate their political loyalties might want to remember the closing refrain of Passover Seders down through the centuries: "Next year in Jerusalem." There will, no doubt, be many American Jews who are still so insecure in their place in American society that they will feel flattered that even a president who has proved himself the most hostile chief executive to Israel in a generation will pay lip service to Judaism in this way. No doubt the planting of this sympathetic story on the front page of the Sunday New York Times is calculated to soften the blow of his Jerusalem policy and his disdain for Israel in the eyes of many of Obama's loyal Jewish supporters. Can any Jew with a smidgeon of self-respect or affection for Israel think that having a president say "Next year in Jerusalem!" while sitting at a table with matzo and macaroons makes up for policies that treat the 200,000 Jews living in the post-1967 Jewish neighborhoods of their own ancient capital as illegal settlers on stolen land? Despite that fact that his diplomatic offensive has virtually no chance of success, Obama has still done something that will permanently alter Middle Eastern diplomacy. By treating the Jewish presence in eastern Jerusalem as a vast illegal settlement, the continued growth of which is an alleged impediment to peace, Obama has made it impossible for any Arab leader to ever accept Israel's possession of this part of the city. This not only makes the already near-impossible task of forging peace that much harder, it is a crushing blow to decades of Israeli and American Jewish efforts to force international recognition of a unified Jerusalem. Perhaps Obama and his coterie of Jewish advisers think they are entitled to expropriate the symbols of Judaism to lend legitimacy to their anti-Israel policies. Of course, if Obama had any real sympathy for the people of Israel or the Jewish people, he might instead spend Monday night reevaluating a policy that appears to concede nuclear weapons to the rabid Jew-haters of Islamist Iran and reinforces the intransigence of the supposedly moderate Palestinian Authority and its allies across the Muslim world." Jewlicious Blog's The Middle sees Obama's escalating the problem. An anonymous, administration leaker accused White House Middle East strategist, Dennis Ross, of taking Israel’s side over America’s side - thereby calling into question the loyalty of American Jews. But not to worry. Tomorrow, some White House person will come out and declare that Israel and America’s bonds are unshakable. Somewhere else, a White House representative – don’t worry, it won’t be Obama because he won’t be caught doing the dirty work – will let a newspaper, a blogger or a congressional committee know that Israel is the undoing of America in the Mid-East and the support of those Americans who advocate for Israel is partly responsible for this. Mea culpa. I apologize deeply for my support of last election’s Democratic nominee for President. We have brought this horrible situation upon ourselves.